The well-known American multinational corporation with a focus on designing and manufacturing consumer electronics and software product, Apple Inc. has launched its new In-Ear Headphones with Remote and Mic, which engineered for superior acoustic accuracy, balance and clarity, aiming to deliver a truly immersive sound experience. Each earpiece of the Apple In-Ear Headphone contains 2 separate high-performance drivers — a woofer to handle bass and mid-range sounds, and a tweeter for high-frequency audio, resulting in rich, detailed and accurate sound reproduction and amazing bass response for all types of music. Three different sizes of soft, silicone ear tips are included so you can find a perfect fit for each ear, creating a seal that isolates your music from your surroundings. Inside each earpiece is a stainless steel mesh cap that protects the precision acoustic components from dust and debris. 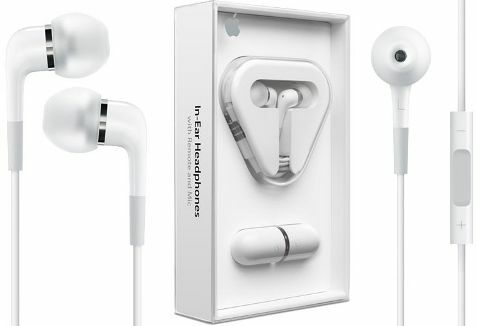 The new Apple In-Ear Headphones that weights only 0.4 ounce (10.2 grams) hits Apple Store for $79, with free shipping in 7-10 business days.